We launched the Del Boca Vista project a couple of months ago based on an idea (wanting a fun place to live with our friends someday) and an aspirational list of qualities for the property we wanted to find: 1) Ugly/run down, 2) Great view, and 3) Walk to a great watering hole. A couple of weeks ago, less than 60 days into the project, we thought we found a perfect property: 2104 Alki SW in West Seattle. This property checked all of the boxes on our high level list, but in the end did not turn out to be suitable for our project due to a pretty heavy restriction on renting the units. Our plan only works if we can each rent out our units until we decide to move in. This is only a small disappointment because we are also waiting for the market to correct -- so at this point our search for properties is really just educational. Our evaluation of 2104 did advance our education though. The property is ugly with 1973 rock on the outside and a goofy little tiny pool and a killer view. 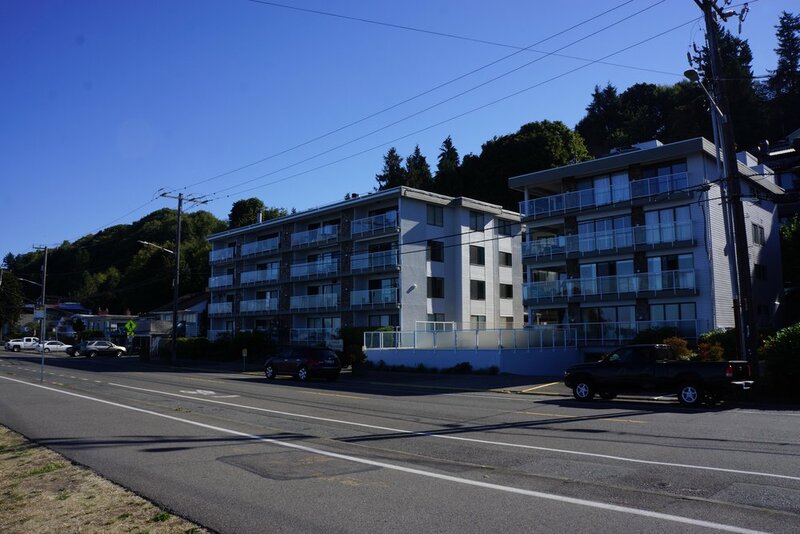 As an added bonus, it has a great underground garage, and large two bedroom units, and is just down Alki from the big beach -- so there would not be so much noise or beach traffic in the summer. The third leg of our evaluation is proximity to a great watering hole. Just 15 minutes walk down Alki we found the Alki Beach Pub which does seem to satisfy our needs -- but I am going to have to do a bit more research to make sure! Looks like good food, live music, and a very interesting crowd. In the reading of the condo association rules, we did find several negatives. As I mentioned above, there is a tight restriction on renting units. There is also a prohibition on pets, and strict noise limits (no musical instruments...). On the one hand, these restrictions are likely to keep the prices down. On the other hand, it presents an insurmountable hurdle on our purchase and hold strategy. So we will keep looking and waiting for the market to reset.